Requesting a resource is a great way to share your ideas with our team of talented designers and teachers. Along with the hundreds of pages of new content we publish each week, we try to include ideas requested by our members. To make the system as fair as possible, members are able to vote for their favourite request. This allows us to see what's popular, and provide a platform for our team to prioritise what to create next. We will automatically begin promoting your request and it will be voted on by the Teach Starter community. If your request receives the most votes, we will begin creating it! Along the way, you will be notified about the progress of your request. How do I vote for a request? 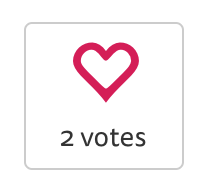 Simply click on the love heart icon to cast a vote! You can submit a change request by visiting the resource page, scrolling down to the comments section, then clicking Changes & Updates.